Oconee County School Superintendent Dr. Jason Branch will offer an overview of the Education Special Purpose Local Option Sales tax issue on the ballot and then answer questions from the audience. Representatives of the Georgia Restaurant Association and of Publix Super Markets will discuss the two Sunday Sales referenda, also on the Nov. 8 ballot. Invitations also have been extended to others who may wish to speak on the referenda. The meeting will be in the auditorium of the Community Center at Veterans Park. Sarah Bell, Russ Page and I have organized the Election Forum for Thursday night. We have organized similar forums in the past. 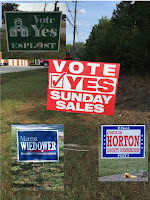 The election campaign has become more visible to those traveling around the county, as Wiedower and Horton have signs along many of the major traffic routes. Bridges’ campaign so far has been less visible. One of the Sunday sales referenda would authorize the Board of Commissioners to allow the sale of beer, wine and liquor by the drink in restaurants on Sundays. The other would authorize the Board to allow the sale of beer and wine in groceries, convenience stories and beverage stores on Sundays. Bridges, Horton and Wiedower are running as Republicans in the special election to fill the spot left vacant in March when John Daniell resigned from the Post II position to run for the BOC Chair position. Daniell is unopposed in the November election. By law, Superintendent Branch is not allowed to advocate for the Education SPLOST, but he can outline the purpose of the tax request approved by the Board of Education and answer questions about the uses that will be made of the projected $45 million in revenue from the tax over its five-year life-span. We have not been able to find any organized opposition to the Education SPLOST to invite to the session. Karen Bremer, CEO of the Georgia Restaurant Association, has indicated she will attend the Election Forum or send another representative to discuss the referendum on Sunday sales at restaurants from the perspective of her industry. Mike Olive, store manager for the Publix in Winder, will represent the grocery chain at the Forum. 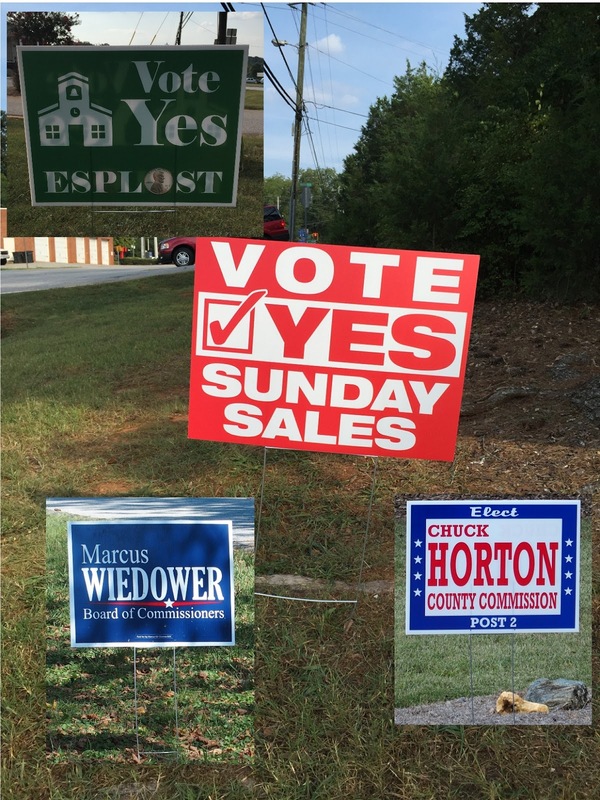 Winder and Barrow County allow Sunday sales. We have invited the Georgia Association of Convenience Stores to send a representative as well. So far, we have been unsuccessful in locating opponents of the referenda who wish to speak, but we will continue to seek them out. The first hour of the Election Forum will focus on the BOC candidates. The second hour will begin with the Education SPLOST and then turn to the Sunday Sales referenda. To date, the Chamber of Commerce, which traditionally holds candidate forums, has not indicated that it plans to do so for the November election. We plan to video record the event and make it available for subsequent viewing on the Oconee County Observations Vimeo site. The Election Forum is open to the public. The last day to register for the November election is Oct. 11, and early voting starts on Oct. 17. Really appreciate your organizing this. "Bridges, Horton and Wiedower are running as Republicans in the special election to fill the spot left vacant in March when John Daniell resigned from the Post II position to run for the BOC Chair position. Daniell is unopposed in the November election"
It's great that Lee, Sarah Bell and Russ Page are stepping up as usual, but why in the heck isn't the Oconee County Republican organization sponsoring a candidate debate??? Embarrassing and irresponsible for them not to do so. they know only a few thousand people will show up to vote. until we get enough people to run as independents nothing will change.